I am looking for a female or male singing partner for my various acts. I am a full-time entertainer and perform as part of a duo, a trio, a quartet, a band, and a production show that performs throughout South Qld. 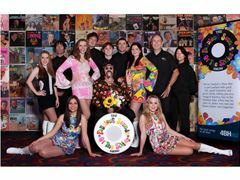 My major show is "The Fabulous Sounds Of The Sixties Show", a 12 person show plus production. We've won Best Production Show at three Entertainer Of The Year Awards for Clubs in South Qld. The show has been proudly supported by Radio 4BH for the past three and a half years. Past cast members include Natalie Blair (Gold Logie nominee 2007/08) who was a part of our show for over two years before joining the cast of Neighbours. Erinn Swan (Sony Music), Poli Cameron (Neighbours), Megan Washington (2010 multiple ARIA award winner) & Nicole Sokolovic (Universal Studios Singapore) are also ex-Love Bugs. Upon application, I can forward personal and professional references for myself and my group plus testimonials from three Love Bugs and Natalie Blair's mother, Maureen. Image is a crucial part of the Fab Sixties Show. The image is young people doing music from 45-50 years ago. We all look like we just stepped out of 1965 so the piercings and tattooed brigade need not apply! We treat it as business. Hence we have an alcohol-free, drug-free policy in the show. I am only interested in auditioning females or males who are considering a career in the entertainment industry and would be willing to make a commitment to our show for at least 12 months. We currently perform, on average, twice a week, mainly on weekends. Money averages at $200 per performance. Experience is not absolutely necessary; just talent, a good look, a great attitude and the desire to work well within a team. If you are interested in the position, please forward me a CV including recent photos and a demo of your singing. I welcome a phone call.